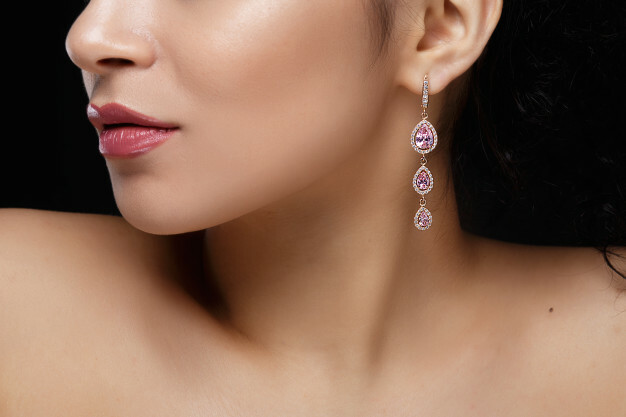 Diamond Solitaire Earrings come with an added value of personal liking which makes an individual care for it a bit more than the other ornaments in possession. So, it’s quite natural to ponder about the longevity of this precious Jewelry. The longevity of Diamond Solitaire Earrings includes the sheen and appeal. If you might think how someone can lose something as precious as Diamond Solitaire Earrings? Well, many do and the reason for that, unfortunately, is callousness. So, if you are looking to protect your Diamond Solitaire Earrings the first thing is to ensure that they are properly locked. Sometimes the looseness might make them fall while traveling or dancing. Also, if you doing some household chore like cleaning your house, gardening or even dusting. Follow a simple rule, if there’s a risk of Diamond Solitaire Earrings getting spoiled with dirt etc., remove it. Chlorine bleach, for example, can easily damage the earrings. And, if you are looking to pack them in your cupboard, do not clutter too many precious together as the might scratch against each other. Be it chemicals in the air or natural oils, your Diamond Solitaire Earrings can lose its sheen over a period of time. Especially, due to oxidation, when it comes in contact with any chemical in the air it loses it a natural glow and you might notice some blur over the surface. I got best professional advice from the people at Hello Diamonds who suggested the right cleaning solutions. Visit the nearest jewelry store to buy the Jewelry cleaning kit and you will be fine. If you are not able to procure jewelry cleaning kit you can make your own solution at your home. Use dish soap and water to create a frothy solution. Dip the Earring into the solution. Use clean towel or brush to clear off the smudges over the surface. Also, next time when you go out to purchase Diamond Solitaire Earrings or other Jewelry item do ask about the Jewelry cleaning kit or how to clean your Jewelry. The professionals can help you with just the solution you should make to clean your Jewelry. So, go ahead and take out your old Diamond Jewelry to make it brand new. Ideally, you should clean the Diamond every 2 months. Rest, the afore-mentioned process if quite enough to maintain your Diamond Stud Earrings.